Associate Professor of Religion Todd Green directing a discussion with Regina Mustafa. 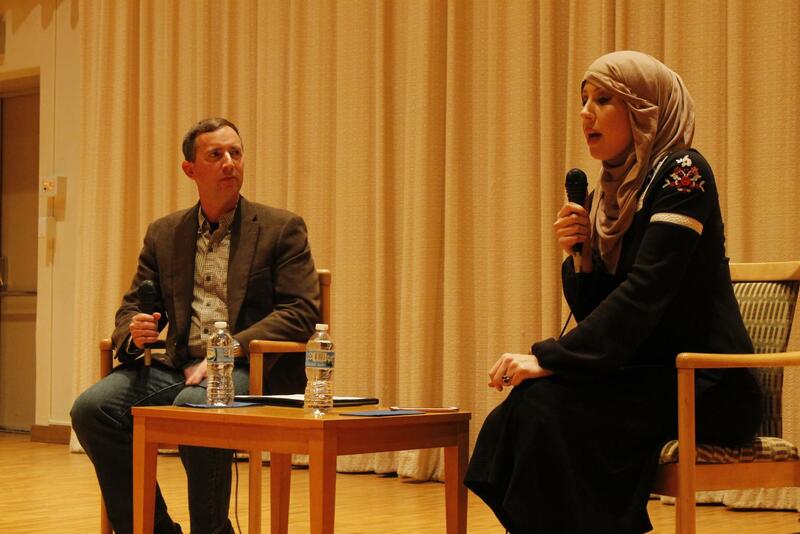 Interfaith activist from Rochester, Minnesota Regina Mustafa spoke about her experience as a Muslim woman working to promote interfaith dialogue and her recent campaign for Congress. On Wednesday, Nov. 1 in the Center for Faith and Life (CFL) Mustafa answered questions posed by Associate Professor of Religion Todd Green before opening the conversation to questions from the approximately 40 audience members. Mustafa spoke about her work with Community Interfaith Dialogue on Islam (CIDI), an organization that she founded in Rochester. Mustafa decided to start an organization for interfaith work after the media’s portrayal of ISIS began to incite widespread anti-Muslim sentiment in the U.S. Mustafa wanted to provide people with information about Islam that counters the negative misconceptions held by many Americans. As part of her interfaith work, Mustafa attends religious services at various places of worship and writes reviews on them for CIDI’s website. She hopes that these reviews will be tools for people who want to learn more about other religions. Mustafa also hosts the Faith Talk Show in Rochester where she interviews guests with different religious backgrounds. During her conversation with Green, Mustafa discussed the challenges of having public conversations about religion because religion is often a ‘taboo’ subject. She said that she has to make sure people of all faith backgrounds can feel safe and respected on the Faith Talk Show, even during uncomfortable conversations. Mustafa answered questions about the intersection of feminism and interfaith work. According to Mustafa, the intersection is important to her because a common misconception about Islam that it is inherently misogynist. During the discussion, Mustafa also talked about her recent campaign for Congress in Minnesota’s First Congressional District. She decided to drop out of the race because she is legally blind and has to rely entirely on others for transportation. The discussion was organized by the Luther group Interfaith in Action, which has just started up again after years of inaction. This is the second event of this kind organized by Interfaith in Action, the first being the Interfaith 101 panel on Oct. 19. Green said that interest in the Interfaith group is growing partly because of the current political climate. He hopes that this rekindled interest in interfaith work will allow for open conversations about religion to occur within the Luther community. He says that one of the reasons why Regina Mustafa is good at what she does is because she is willing to have difficult conversations. Interfaith in Action member and event attendee Elizabeth Wiebke (‘19) said that she was excited to see new people at the event. She said that Mustafa was inspiring to her because of her proximity to the Interfaith in Action group at Luther. Green saw his conversation with Mustafa as a way to show audience members that Islam is diverse. According to Green, this will provide another view of Islam that is different from the dominant, often negative portrayal of Islam from the media.